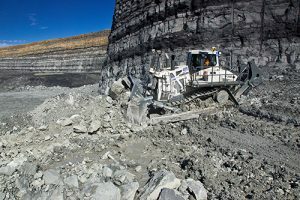 Liebherr’s new crawler tractor now offered to the U.S. market works in mining and quarrying applications. Photo courtesy of Liebherr. Liebherr released its PR 776 crawler tractor for the first time in the United States at MINExpo International 2016. The machine is designed for tough mining and quarry applications. The 77.2-ton crawler tractor is powered by a 757 hp Liebherr 12-cylinder diesel engine, and it has a maximum operating weight of 81.6 tons. It comes equipped with blade capacities of either 24.2 cu. yd. or 28.8 cu. yd. 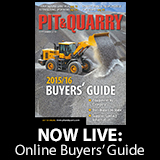 According to Liebherr, the PR776 offers efficient and safe operation to customers. A new feature in this machine class is the infinitely variable hydrostatic travel drive, which is used for all of the company’s crawler tractors. In addition, all Liebherr Generation 6 crawler tractors include an eco function to provide fuel savings.